In‐hospital cardiac arrest is rarely sudden and may be preventable if interventions are performed when patients are in the early stages of clinical deterioration. However, identifying high‐risk patients remains a significant challenge. Scoring tools based on vital signs and laboratory findings have yielded limited accuracy and require labor or technology to capture prospectively. We hypothesized that an intuition‐based scorinq tool would predict clinical deterioration on the wards. Intern, resident, and attending physicians and midlevel providers (nurse‐practitioners or physician assistants) on 9 medical ward services at a tertiary‐care hospital were prospectively surveyed every call cycle and asked to rate each of their patients on a scale from 1 to 7 based on the patient's likelihood of suffering a cardiac arrest or requiring emergent transfer to the ICU within the next 24 hours. Interrater reliability was assessed between providers for the same patient‐day using weighted Kappa statistics. A receiver operator characteristics (ROC) curve was constructed for each type of provider, and the area under each curve was calculated to measure the accuracy of the scoring system. These areas were compared to one another using the chi‐square statistic. Between January 14, 2008, and May 31, 2008, 129 eligible providers (88%) consented to participate and provided 5320 individual scores on 1490 patients, with a data capture rate of 75%. Kappa coefficients ranged from 0.32 to 0.43 between the different types of providers, with the greatest aqreement occurrinq between the attendinqs and midlevels. The risk of clinical deterioration in‐creased exponentially with increasing scores, from 0% (for a score of 1) to 21%‐34%, depending on the type of provider (for a score of 7). 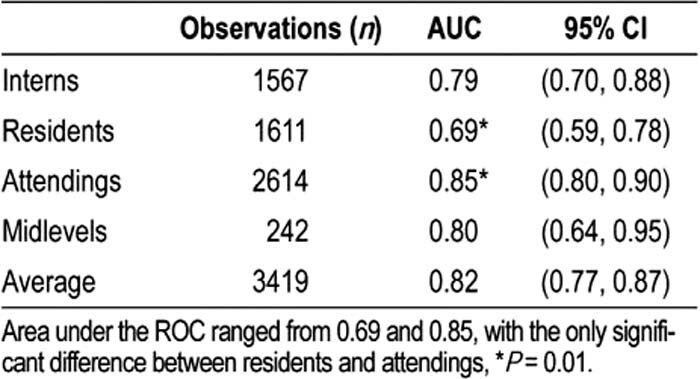 Area under the ROC curves ranged from 0.70 for residents to 0.85 for attendings (P = 0.01). The other groups were not statistically different from one another. A 7‐point scale of provider intuition yielded fair to moderate interrater reliability and fair to good accuracy in predicting cardiac arrest and emergent ICU transfer. Attending physician scores correlated best with patient outcomes. This simple tool may be useful for identifying ward patients at risk of clinical deterioration. Majority of clinically decompensated patients are captured by PARs of 4 or higher. D. Edelson, Philips Healthcare, research grant, consulting, speaking honoraria; American Heart Association, research grant. Retzer E, Weidman E, Walsh D, Woodruff J, Davis A, Minsky B, Meadow W, Meltzer D, Edelson D. Provider Intuition Predicts Clinical Deterioration in Ward Patients. Abstract published at Hospital Medicine 2009, May 14-17, Chicago, Ill. Abstract 82. Journal of Hospital Medicine. 2009; 4 (suppl 1). https://www.shmabstracts.com/abstract/provider-intuition-predicts-clinical-deterioration-in-ward-patients/. Accessed April 25, 2019.